NASA teased a "surprising" announcement for Monday, based on Hubble Space Telescope images of the celestial body, which many experts believe could contain a subsurface ocean, even possibly some form of life. The US space agency has already proclaimed that Europa has "strong evidence for an ocean of liquid water beneath its crust and which could host conditions favorable for life." 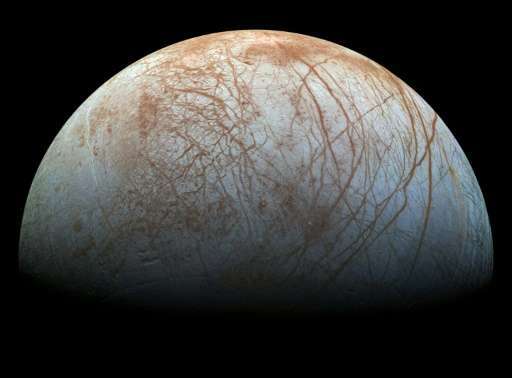 At Monday's announcement, "astronomers will present results from a unique Europa observing campaign that resulted in surprising evidence of activity that may be related to the presence of a subsurface ocean," it said in a statement. The announcement will be made at a news conference at 2 pm (1800 GMT) Monday featuring Paul Hertz, NASA's director of astrophysics, and William Sparks, an astronomer with the Space Telescope Science Institute in Baltimore. NASA announced last year that it intends to send a robotic spacecraft, equipped with a suite of scientific instruments, to circle Europa in the 2020s. In 2012, NASA's Hubble Space Telescope "observed water vapor above the south polar region of Europa," suggesting water plumes may be erupting from the moon, the space agency said. If those plumes are confirmed, and if they are found to originate from a subsurface ocean, scientists hope the spacecraft could study their chemical makeup, revealing characteristics of the water without having to drill through ice. Jupiter, nicknamed the king of the solar system, is surrounded by more than 50 moons. Last year, data from the Hubble Space Telescope confirmed that Jupiter's largest moon, Ganymede, has an underground ocean that contains more water than Earth's, broadening the hunt for places in the solar system where life might be able to exist. In the case of Ganymede, aurorae—displays of light in the atmosphere—glimpsed by the Hubble Space Telescope allowed scientists to confirm the long-suspected subsurface saltwater there. Because aurorae are controlled by a moon or planet's magnetic field, observing changes in their behavior can lead to better understanding of what exists under the surface. The solar system's largest planet, Jupiter is the fifth from the Sun. NASA's $1.1 billion Juno spacecraft successfully slipped into orbit around the planet in July on a 20-month mission to learn more about how the gas giant formed, and to probe the origins of the solar system. It would be interesting to fly through the plumes and catch some organisms. They should send ground penetrating nukes to these places, set them off and analyze the vapour. It would be much cheaper and simpler than a drilling expedition. They have no idea how thick the ice is, if they'll land on ice. Oh, my. Did rrander really say that? Yeah, let's destroy it like we are doing to the Earth. When they are gone, we will all be rich.